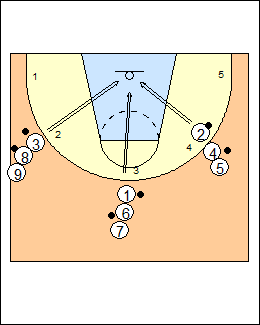 Five shooting spots around the arc, three lines of players, each with two balls, each line shoots for 1 minute from one spot (rebound your own shot) then moves to a new spot, continue until all lines have shot from all five spots. Regular scoring (2-point and 3-point shots), a team total of 90-100 points per spot is great. Takes about 8 minutes to complete, including transition between spots.